Scott Humphrey, CEO of the World Floor Covering Industry Association (WFCA) and president of the Floor Covering Industry Foundation with WFCA board member Jacobi from Jacobi Carpet One. [Dalton] After 22 years of operation, the Nebraska Iowa Floor Covering Association (NIFCA) board voted to disband their organization, a local affiliate of the World Floor Covering Association (WFCA). 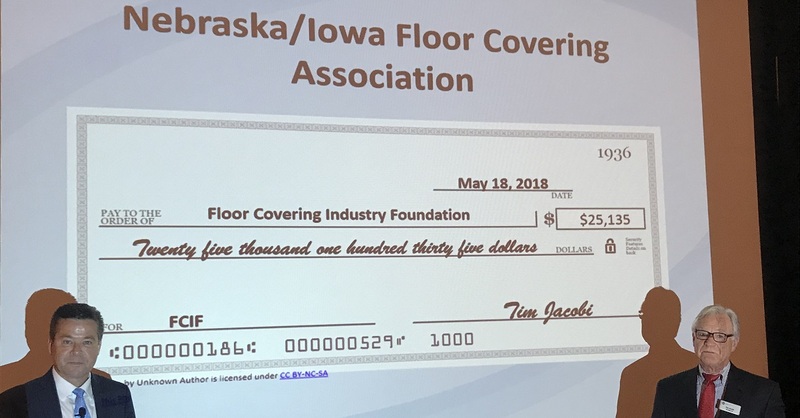 The NIFCA board voted to donate the remaining funds to the Floor Covering Industry Foundation (FCIF), a 501(c)3 nonprofit organization who assists families in the industry who are suffering from catastrophic illness or severe disability. Board members of the NIFCA include: Chris Nordin, president; Rachael Duncan, president-elect; Tyler Brandt, secretary/treasurer; and other directors: Mike DeForest, LaSchan McCarter and Dustin Ruzicka.